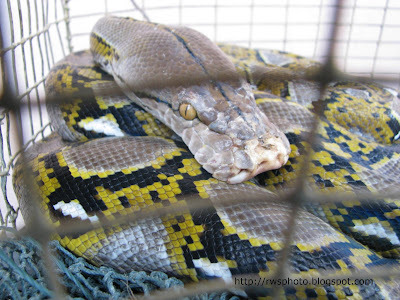 Python Reticulatus is a species of python found in Southeast Asia, including Borneo. Adults grow to a maximum of over 28 feet (8.7 m) in length and are the world's longest snakes, but are not the most heavily built. Like all pythons, Python Reticulatus are non-venomous constrictors and normally not considered dangerous to man, even though large specimens are powerful enough to kill an adult and attacks are occasionally reported. An excellent swimmer, Python reticulatus has even been reported far out at sea and has consequently colonized many small islands within its range. The specific name is Latin meaning net-like, or reticulated, and is a reference to the complex color pattern. The irony is that, the cage was kept at the back of the Bako National Park office located at the Boat Point, Kpg Bako. Thus, the suspect is likely to be employee or staff of the National Park and any animal at the National Park protected or otherwise, are suppose not be killed, harmed or trapped. poor animal, but beautiful specie anyway! very interesting blog! Congrats!